A crowdfunding to support our festival “Secousse” ! We need you! Help us fundraise our revolution! Our festival “Secousse! Des peuples en Révolution” (“Quake! Peoples in Revolution!”) is the first major event of La Boîte a Histoire. To make it happen, we need your help! In 1848, the world is in havoc. Revolutions are happening in various part of the world. In Europe, those revolutions are known as “the People’s Spring” and remain relatively unknown to the general public. Yet, it is in that year that France abolished slavery and instituted universal voting rights for man. What is the goal of the festival? Through varied activities, we want to transmit history differently. We believe that knowing history allow us to question critically the past and understand the world in which we live. The transmission of history then needs to move out from schools and other institutions (where it is strongly associated with learning historical dates by heart) to festivals and other public events with more creative, original and didactical activities. For this festival, we have brought together many institutions. But it is not enough! We need your help to make this project happen. This is why we are fundraising! “1848! Peoples in Revolution” will take place on the weekend of the 21st to 23rd of September 2018 at La Colonie and La Médiathèque Françoise Sagan in 10th arrondissement of Paris. Read more on “1848! Peoples in revolution”. 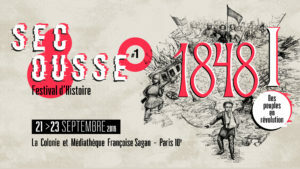 Next Next post: The festival Secousse 1848 has a website !